Also, is VGT beatable without Platemail? Though for the Vampy run the immunity items have no use. So I don't restart because of the shop spawn for a standard run. But for some harder runs (VT or purist) I sometimes scum for a specific item, diety or glyph. And I think Platemail is necessary for the VT run. (You mean a Vampy run, right?) I've done VT VGT Vampy run with both Yendor and Dragon Shield prep, but both had found the Platemail. Yeah, I meant the Vampire, of course. Thanks, this is helpful. I guess I have to do the gold challenges first before I tackled VGT. Otherwise all the restarts due to bad items drain too much money and waste my time and nerve cells . Forget about the time, I played some boardgames with my friends during the run. This is probably the worst shop spawn considering what I've veto'd for a standard VGT run, a Stone Sigil and a Spoon were the best items I've got (and the Sigil is pretty useless compared to other items for the Paladin of GG), and I still managed to win. Though it was extremely close; the last hit was literally my last bit of hit with everything I can pull off. Granted I've got 2nd tower PM, but since I had quite some unfortunate levelup timings, so I think purist miser may be possible with considerable luck. I like purist over VT just because it costs nothing. 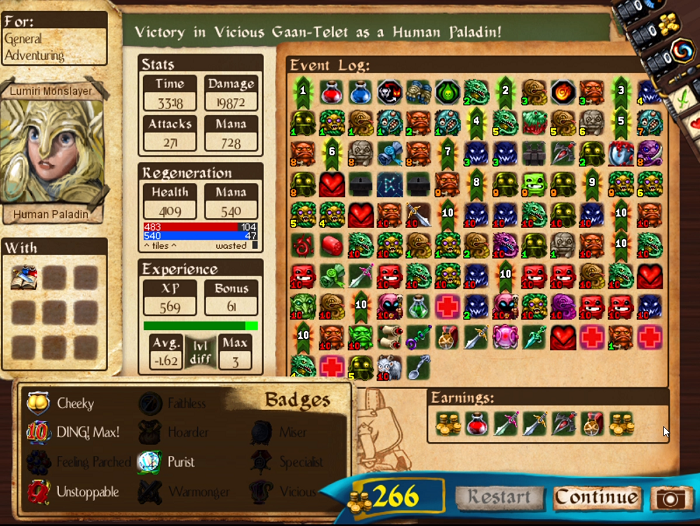 Now I've learned how to use Paladin of Dracul with the body pact. I once thought the warrior's pact (hp+1) was good to go with the Stone Sigil, because even with 0 piety when I kill one I get +3 piety which is immediately spent to fuel the pact. In contrary, body pact needs 4 piety per application and it means I need not to use HALPMEH during a fight. However it wasn't too good because the health approach consumed the bloodpools too fast. The answer was to consume bloodpools and piety sparkles to get enough piety to fuel the body pact. For a side note: if you had not enough piety to activate the body pact (3 piety if you have lifesteal) at the first hit, then you can never pull off the resists from the enemy even if you have enough piety for your next hit. That Dracul run is great. Castelvan wrote: That Dracul run is great. Because my last (and first) goat win was very lucky (EM on curse) and had a serious mistake (punished by EM, I thought I was under TT), I'm uploading a new goat run. The run would be more reliable, and more educational. Principle is still the same - MADLY convert your foods under JJ or GG. Just don't buy the lifesteal ability. Haven't won anything... 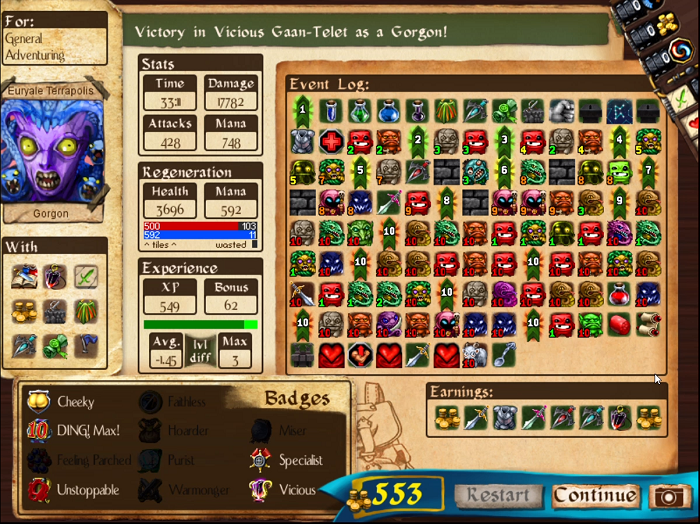 The most successful run was VT Gorgon with Binlor+PM start. I was able to get 65% resists quite early, but I think I really need HALPMEH to be successful. Purist Berserker and Orc Monk (to take a vid) was not bad, but far from win. btw, I quick-mathed blackspaces and mana regen to make sure why pure caster build isn't possible in VGT. But if there's only standard health no resist monsters in the subs, that's already 10,300 health. Simply there's not enough damage. Even the Chemist shouldn't do the job. Haven't done any math, but do not forget Dragon Soul. Someone spent 6 mana on clearing whole VGT once they've picked it up in some parallel universe, they say. We made an expansion and it is awesome. Download over at ddmod.weebly.com. Oh my lovely Gorgon! 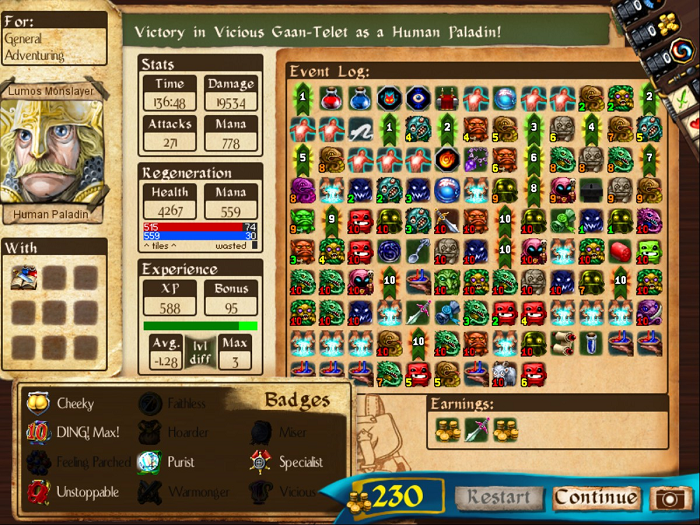 It's my second win of VGT VT other than Vampy/Infinimuter. Gorgon is really strong with Binlor+PM approach, because she has initial ENDISWAL (-35 piety loss) and starting 25% pr, where mr can be compensated from Binlor. Also she only needs to recover attack bonus unlike Monk which is far easier than base attack. Knockback is a great addition in particular. Purist with Gorgon would be really hard just because she cannot start with Binlor+PM.